Family isn’t always by blood. Family is who you are willing to bleed for. Refusing to yield to his father’s will and expectations to one day take the reins of the family business, Sam McGregor leaves his home in Texas. 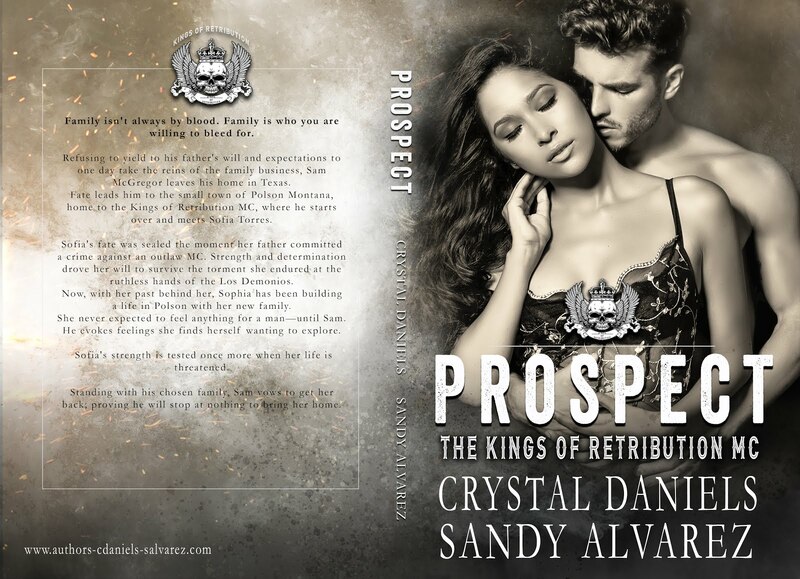 Fate leads him to the small town of Polson Montana, home to the Kings of Retribution MC, where he starts over and meets Sofia Torres. Sofia’s fate was sealed the moment her father committed a crime against an outlaw MC. Strength and determination drove her will to survive the torment she endured at the ruthless hands of the Los Demonios. Now, with her past behind her, Sophia has been building a life in Polson with her new family. She never expected to feel anything for a man—until Sam. He evokes feelings she finds herself wanting to explore. Sofia’s strength is tested once more when her life is threatened. Standing with his chosen family, Sam vows to get her back; proving he will stop at nothing to bring her home.